This week, Hack Circus returned after a 3.5 year break from live events, and almost two years since our last issue came out. The event took the form of a ceremonial induction to a distant future secret society. 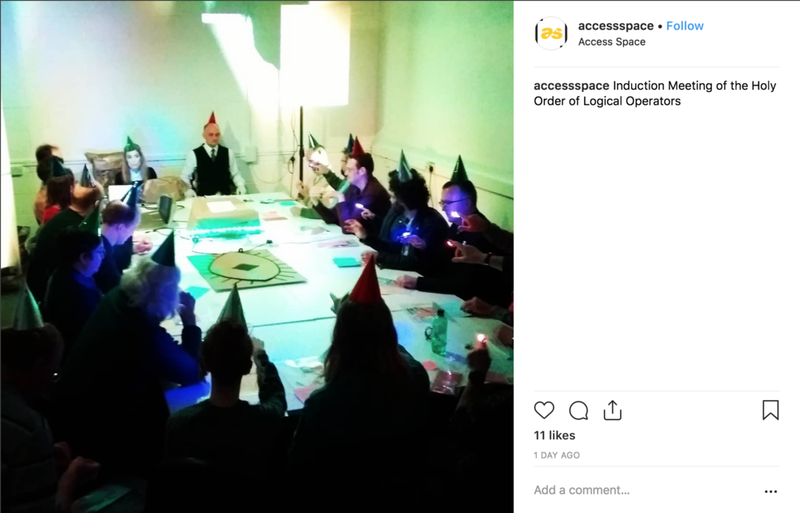 20 or so new recruits to the Holy Order gathered for their meeting at Sheffield’s Access Space, where your Ringmaster had been granted a three week long residency on the theme of ‘post-digital’. This event was the culmination of that residency. It is the distant future. Humans abandoned Earth long ago, and now live on Earth 6. These future humans have begun receiving messages emitting from distant Earth 1, which, though long gone, is still present in the digital signals it sends across the universe. The messages appear, without context, on the signal receivers of the Earth 6 humans. Some of the future humans have joined the dots on these mysterious messages, finding meaning in the reams of ancient, 21st Century digital gibberish arriving on their planet every day. These people have established themselves as the Holy Order of the Logical Operators. In addition, the Order have some precious artefacts whose original purpose can only be guessed at – a small hard item known as the ‘Polished Stone’, and a larger, folding ‘Arcane Device’, passed down through hundreds of generations, and now gilded atop an illuminated plinth. In between live thought-o-grams from the Worshipful Grand Masters, there was reverence to the mysterious messages of the Digital Ancients, algorithmic drawing and music, AI restoration, Earth 1 archaeology, singing, ceremonial dancing and more. You can get a sense of it from the photos in the gallery below. Click here for a short video of the new inductees performing the ceremonial movements. More images and video here. Is Hack Circus back? It would be really good to do more. They always involve a lot of work from a lot of people, but I think we are edging towards some kind of product or repeatable model. This one was made possible by the extraordinary efforts of the contributors, as always, and Access Space, who went way beyond the call of duty. That isn’t always the case, but when it does happen, it’s amazing. Watch this space. Older:New podcasts ready to download now!